In this video I finally get my blacksmithing forge running on some hardwood lump charcoal and I forge a rebar throwing spike as a quick test. This is my first forging video using an actual solid fuel forge, so needless to say I’m super excited about this one. I built this blacksmith’s forge over a year ago with a friend of mine who is a full-time blacksmith. 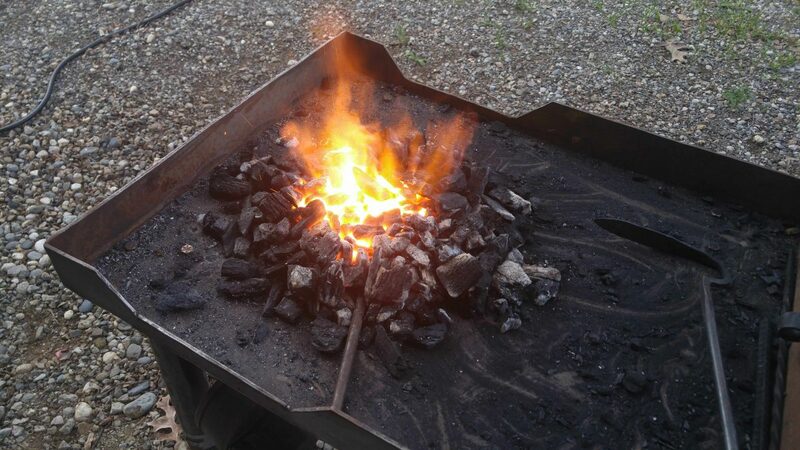 This forge was made to burn coal, but with a little modification to the air flow grate, I got it running swimmingly on hardwood lump charcoal. This forge was made from a solid piece of plate steel that was folded and cut into shape. The fire pot is made from a ground down brake drum, and it features an electric blower and black pipe with end caps for the legs. I will be doing a video or a slideshow soon with some more info on how it was made, so stay tuned for that! $27 for 3 spikes $36 for 4 spikes $54 for 6 spikes. Shipping will be between $10 – $12. And this price is the same if you order 3 or if you order 6!